With a roll of manila paper in each of their hands, Elson, Dina, Mirna and Ingrid walked through the front door of the office at FNE with a cheerful “buenas tardes”, then quickly ran through a rehearsal of the charla that they would be leading later that day in the community of Chiac. One by one, the four students practiced their respective parts of the talk on soil conservation. 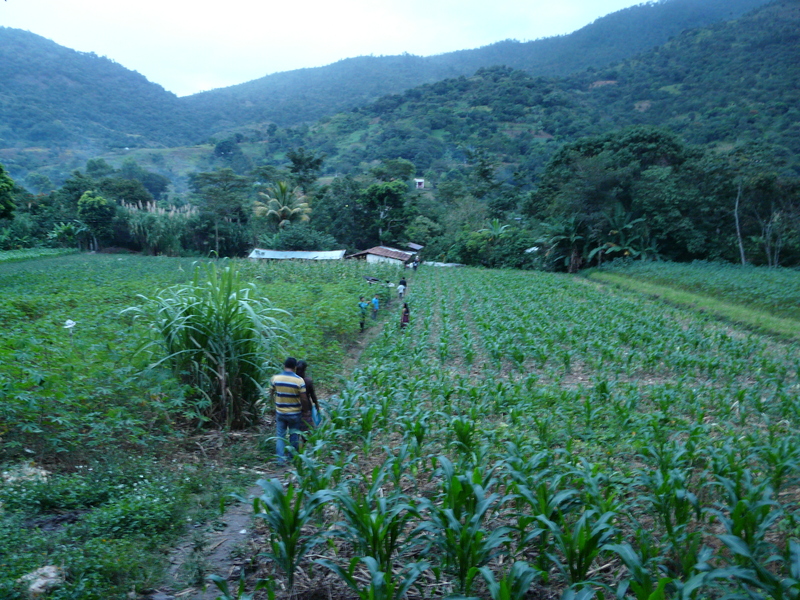 Then in the early afternoon, we piled into the back of the FNE pickup truck and headed out to the Chiac Community. Once in Chiac Juan Dolores Grave, the community leader, placed an announcement on the loudspeaker (yes, it surprised me too), and within minutes the 45 project participants came together at the meeting location. 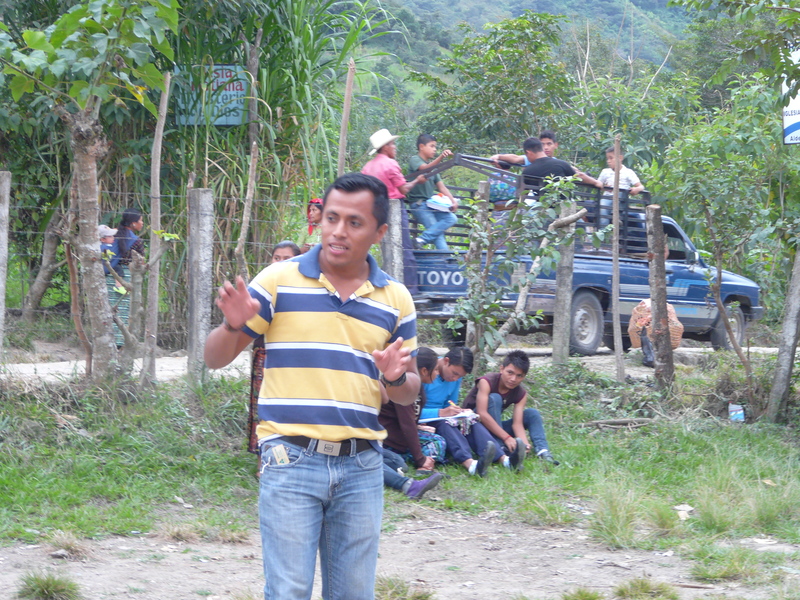 Juan Dolores got the attention of the community, and then introduced Elson, Dina, Mirna and Ingrid. Elson gave a preview of the day’s activities: He explained that, first, he and his peers would give an explanation of four basic soil conservation techniques, and then, the participants would break into three groups to participate in a hands-on demonstration. 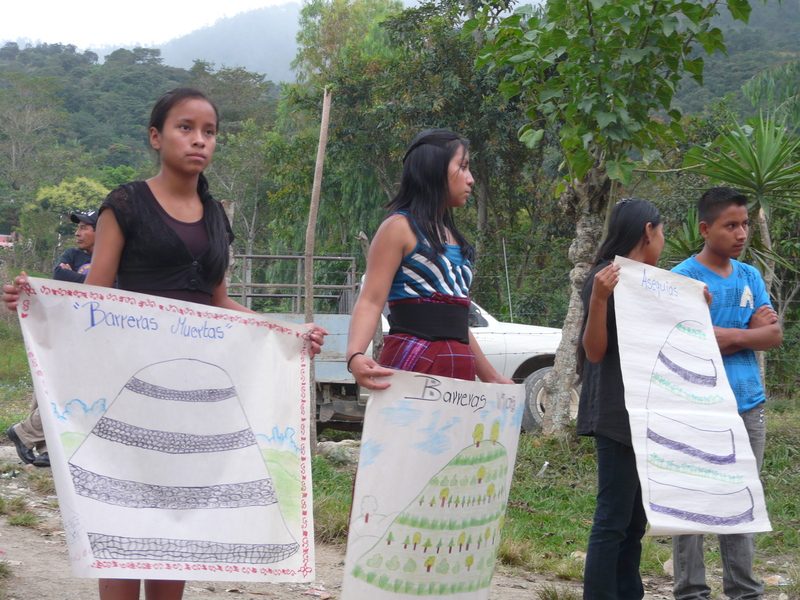 Using hand-drawn posters, the students introduced community members to four soil conservation techniques. After pausing for questions, Armando summarized the basic idea: to create physical barriers to slow water as it carries topsoil down a hillside. Whether barriers are made of stones, dried logs, reeds, or other materials, they all serve the same function. The more runaway soil is given a chance to settle, the less is lost. 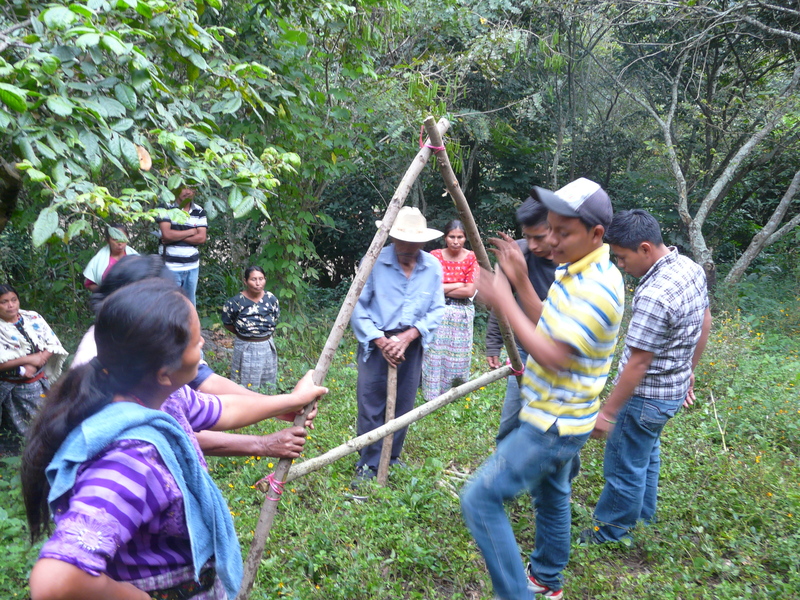 With the help of Juan Dolores–the community leader—the 45 participants were split into three, 15-person groups. 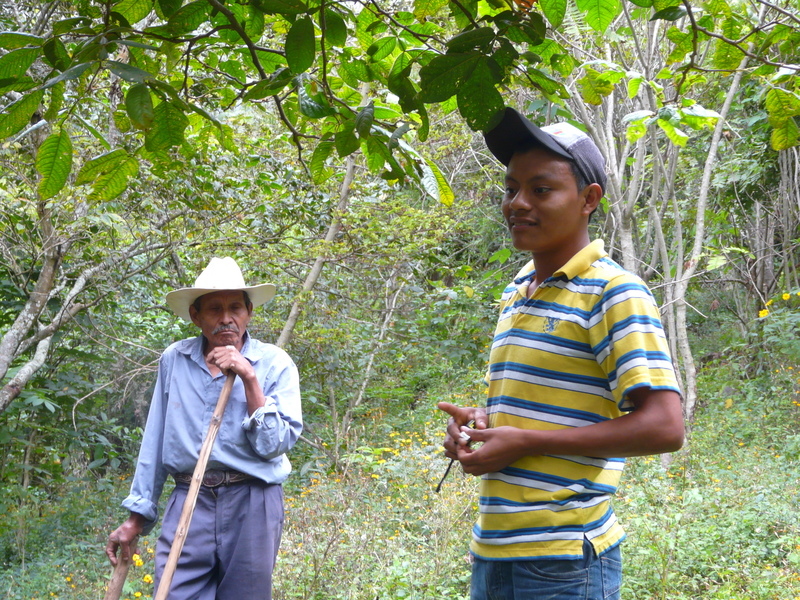 One of these groups was led by Armando, and the other two groups were led by local agronomy students, one of whom was our very own Manuel, a member of our 2011 cohort of scholarship recipients. The three groups fanned out to different sites that had been pre-selected by the community leader for the demonstration workshops. I went with Manuel’s group, eager to see him in action. 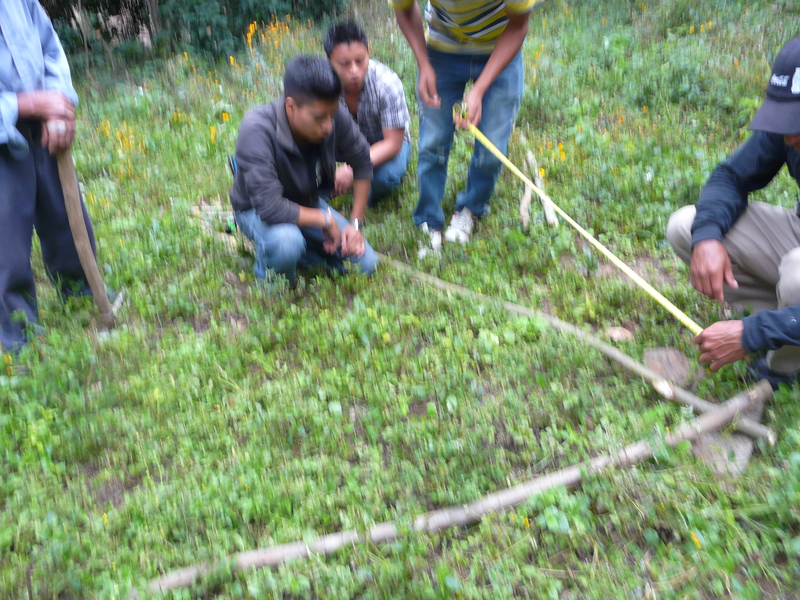 Manuel explained that he would be teaching participants how to build and use an “A-frame model”, a tool for measuring the incline of a hillside. He explained that this was important for the construction of barriers. Just eye-balling it, he said, can lead to barriers that are uneven and ineffective at preventing erosion. 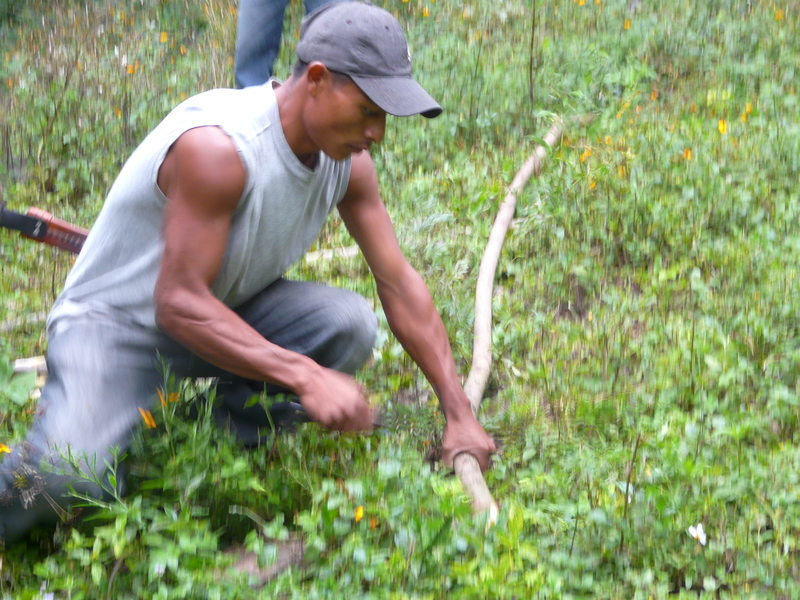 Getting right to work, Manuel said, “I’ll need two poles two meters long, and one pole one meter long.” Manuel spoke at a brisk pace and with poise that seemed to invite the active participation of the community. Two men from the community rushed to the job, taking out their machetes and cutting down two sticks to the appropriate length. 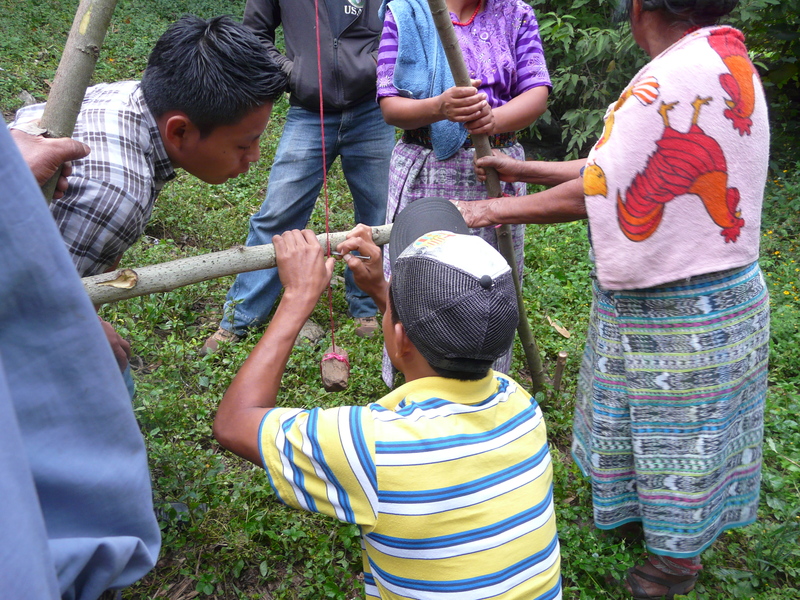 Manuel pulled out a tape measure, to ensure the poles were of the correct length. He fastened the two long poles together using a rope, with their points converging in the form of an “A”. He then requested a 1-meter pole, which bisected the two-foot poles. Again he tied the pieces together with string, and the type A model frame was complete. Manuel stood up the massive letter A and displayed it to the community. Manuel then took out a piece of string and tied one end to the top of the A-frame, and the other end to a stone he had found. “This is what we do, we use the materials around us,” he said with a sort of off-handed wisdom. With the rock dangling down the mid-line, Manuel marked where the rock hit the midline. He then spun the model A around, and again marked where the string hit the mid-line. He explained that the point in between his two marks was the actual center. 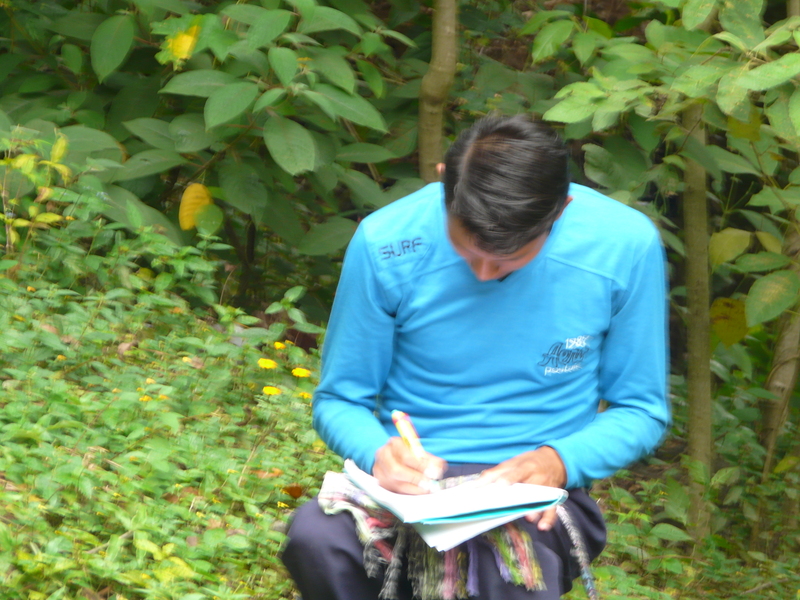 José, a member of the new group of VyM students, furiously took notes. He was responsible for recording the day’s events, and will be responsible for keeping track of these procedures so that students can guide community members in building these A- frames on their own. 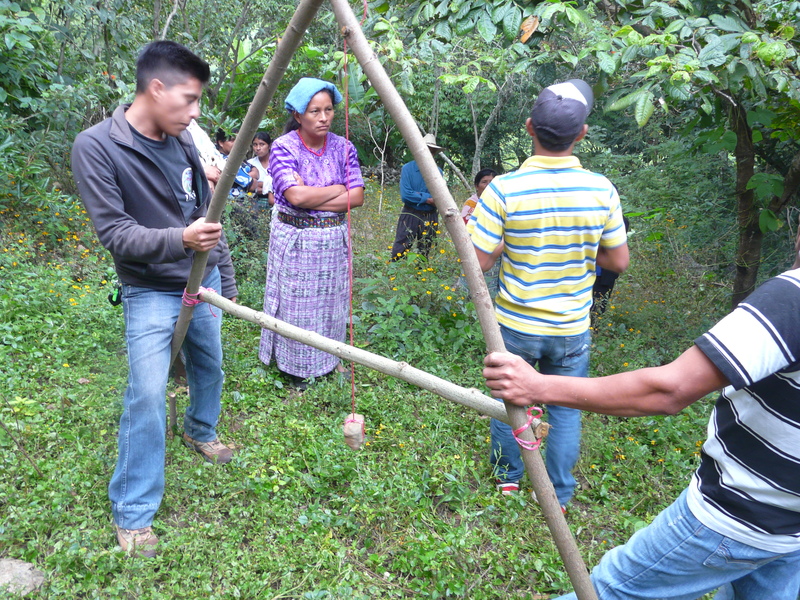 Finally, Manuel demonstrated how the A-frame could be used to mark out contour lines. Manuel and Macario adjusted the feet of the model A so that the string lined up perfectly with the midpoint. This ensured they were on a level plane. They then dug two stakes into the ground where each of the legs of the A-frame were placed. They repeated this process 10 times, leaving a trail of 10 stakes marking an even line to guide the construction of their barrier. As the sun was beginning to set, Manuel stopped and asked the group if they had any last questions. Several people asked very specific questions, which showed, to Manuel’s delight, that they thoroughly understood the technique and were now concerned with mastering its finer points. The group then headed back down the hill, across the river and then through the cornfields, and into the back of the pickup truck where we headed back to Rabinal. The next week, we will return to the community to deliver basic materials that will allow community members replicate these techniques on their own.